From left to right - Kasper Bosmans, Legend Decorations, 2016; Legend Sint Rombout + Vitiligo, 2016. 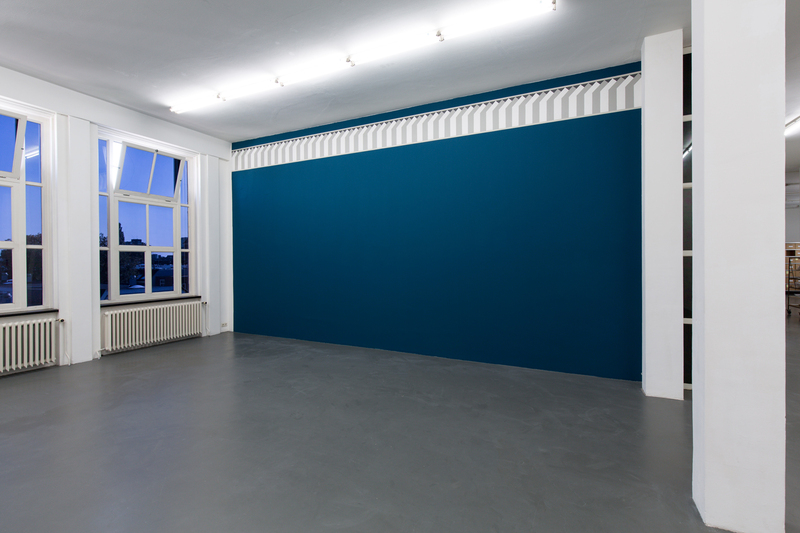 Kasper Bosmans, Specimen Days installation view at S.M.A.K., Gent, 2016. Kasper Bosmans, Legend Sint Rombout + Vitiligo, 2016. 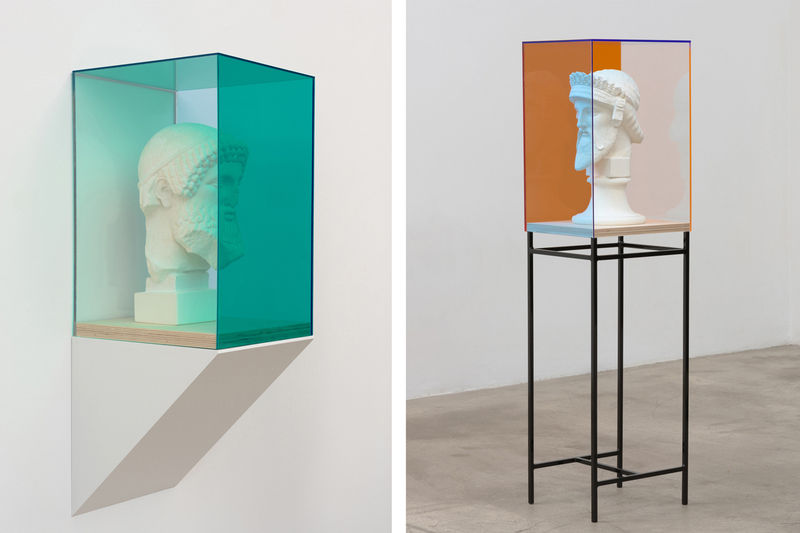 From left to right - Kasper Bosmans, Hermès in Exile (High), 2016; Hermès in Exile (Corinth, Mounted), 2016. Kasper Bosmans, WDW25+ Mural: Urbanism, 2016. 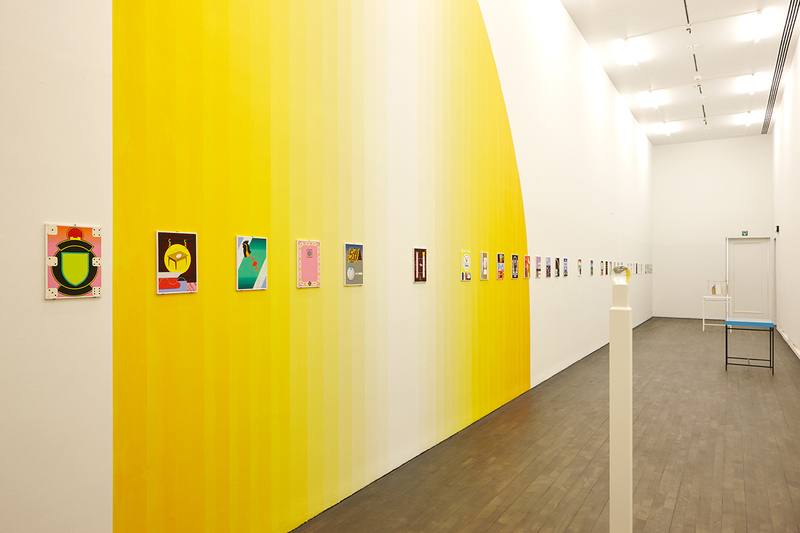 Decorations installation view at Witte de With Center for Contemporary Art, Rotterdam, 2016. Kasper Bosmans, Bronze Legend, 2016; WDW25+ Mural: Migration (Gibraltar), 2016. Kasper Bosmans gathers input from cultural memories that were once common and close to home. He systematically arranges this acquired knowledge into “legends”—small paintings on panel where encyclopedic and mythological anecdotes coexist in stylized, figurative forms. 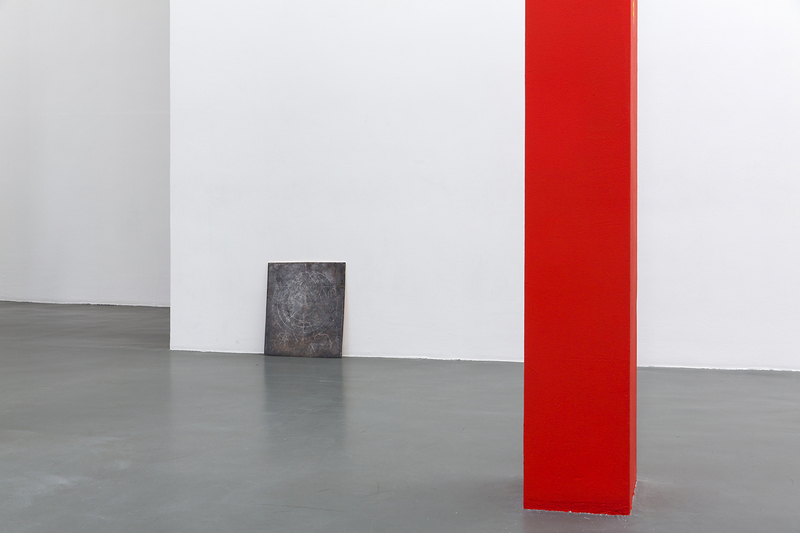 This summer, the artist started a six-month residency at WIELS. We recently met at his third-floor studio, where the walls were lined with paintings in progress, and a scale model for an upcoming exhibition occupied the center of the room. CAROLINE DUMALIN: When I first visited your studio about three years ago, your paintings were very different. You showed me monochromes on peculiar supports, such as a purple banner draped over the back of a donkey and a green rectangle applied on a marble slab. When and how did this shift occur? 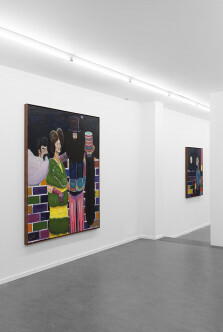 KASPER BOSMANS: At that time, I found it difficult to accept a painting as a unique object. I now try to make a legend painting for every occasion that prompts new work. These are, as the name indicates, legends to read or decipher the work, and it doesn’t matter if they were made before or after the related work’s completion. I started out making them as substitutes for textual explanations—they function as mnemonic devices to condense and store information. Collecting information for figuration keeps me going. I’d rather see my oeuvre culminate in a grand opera than as a group of forcedly autonomous works. CD: What information are you, or they, currently processing? KB: Witte de With is celebrating its twenty-fifth anniversary with WDW25+ Commissions, and I was invited to create works based on their archives. The legends will be present, but only visible during a public event. For each box selected from the archive I made a legend painting on paper, which is pasted on the inside. The one for Paul Thek, for example, refers to his Dwarf Parade Table (1969), which features a dog that hangs underneath the table as if it were walking upside down. I noticed that the dog had played an important role in Thek’s domestic life when we found a photo album in the archives, which resulted in a new interpretation of the installation. The main component of the show responds to a question raised by director Defne Ayas as to what the “plus” could mean. What is missing from the archive, from the exhibition histories? Folk art! 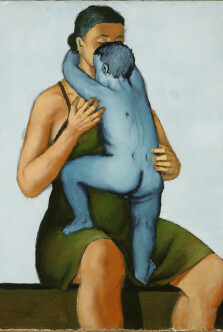 Anonymous works by people who are not or do not want to be known as artists. CD: How did you go about including such a vast and elusive category? KB: The idea was to couple the artists invited by Witte de With with an external archive, and I chose that of Asger Jorn’s Scandinavian Institute of Comparative Vandalism, now housed in the Silkeborg Kunstmuseum. The institute was founded in the early 1960s with the ambition to revisit the history of art as we know it, literally by traveling around to churches and documenting pre-Renaissance Nordic art. Vandalism here refers to the Vandals, a Germanic tribe that migrated from Scandinavia across Europe and is believed to have caused the downfall of the Roman Empire. Folk art, in their approach, provided an alternative to the classical origin story of European art. CD: Are you alluding, in a larger sense, to an era of art before it was destined to end up in museums? 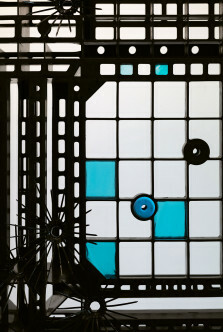 KB: I always associate folk art with pre-individualism in art, when it was still close to craft. That all ended when Giorgio Vasari wrote his Lives. The Scandinavian Institute of Comparative Vandalism makes for an interesting, if problematic, case study because of Jorn’s dominant personality, which undermines their collective endeavor. His texts accompany the 10,000 Years of Nordic Folk Art photo books, all but one published after his death. Jorn’s analysis is above all visually relevant, because of his selection, ordering, and combination of images. He provided an accumulative account without conflict, in contrast to the schisms that historians often like to emphasize. It’s a curious contradiction: the institute was dealing with an anonymous heritage that, ultimately, can’t be separated from this major artist’s biography. 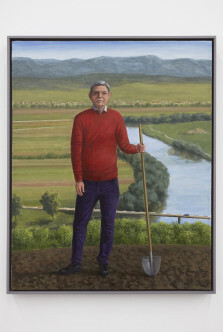 CD: Has this example of the contemporary artist as historiographer influenced the role that you yourself have adopted, in terms of using folk art as your material? KB: I want to approach the subject in a poetic, associative way and simply show some of the most striking photographs that Gérard Franceschi took for 10,000 Years of Nordic Folk Art. I don’t intervene, or even know much about them. The majority of the exhibition, as you can see in the scale model, consists of large murals that I’ve modeled after decorative surfaces. CD: Your contribution continues a pronounced interest in folklore and local traditions, which seems to have been present in your practice since the very beginning. KB: I’ve always been drawn to a kind of “domestic activism.” I recently saw a beautiful show at the New York Historical Society about political patchworks. The young United States doesn’t have a long-standing history of high art. I even dare to think that the American flag is directly derived from a patchwork. CD: What is it that you appreciate in folk art? KB: Folk art is very accessible, sometimes superficial, and always anonymous. I feel it can be read by everyone, which makes it somehow universal. It’s a social idea—art or objects made by and for the people. I value its simplicity and precision in expression. I use anecdotes that underlie folkloric culture as a structure to realize a work, but I take care not to arrive at a synthesis. I want this material to stay pure, by containing all ideas in a figurative form. CD: Can you give an example of how you’ve used such an anecdote? KB: My series of sand carpets combine two unrelated anecdotes that were current in the low countries until the mid-twentieth century: the tradition of housewives who scrub their stone floors with white sand, and the use of caged canaries to detect poisonous gases in mines. 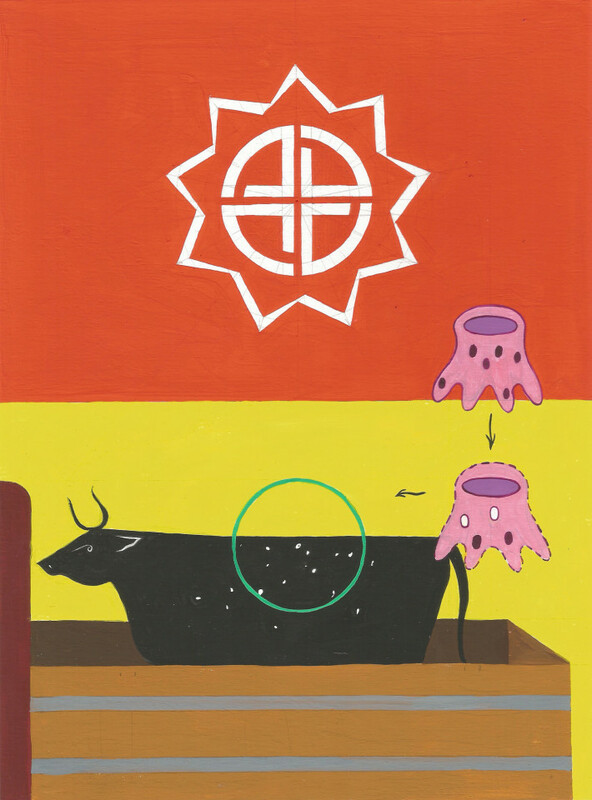 Another example is my legend painting that places the tale of Saint Rumbold, who defeated a demon in the swamps of Mechelen and had its hairy skin buried underneath the cathedral tower, next to the cows of Fukushima that developed the skin disease vitiligo after the nuclear disaster. The latter can be characterized as a dermatological diptych, dedicated to the subject of skin, without aspiring to any philosophical discourse. I want all of these subjects, no matter how small and manifold, to be part of my work. CD: You grew up in Lommel, a Belgian city adjacent to the Dutch border, known for its sand quarries and nature reserves. To what extent did your personal background influence your pictorial language, which often includes animal iconography? KB: Many people comment on the recurrence of animals in my work, and perhaps I’m at the point of continuing this impression for the fun of it. I don’t think about my background much. 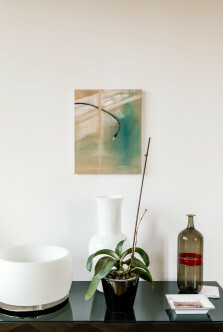 I am sensitive to place; I see each context as a specimen, and then try to pin it like a butterfly. In this way, a specific anecdote can represent a more general phenomenon or problem. For instance, I made a very Belgian work around the Cinquantenaire Museum in Brussels. When it rained, I’d rush to an area in the museum where the roof was leaking and catch the water in a bottle. The underlying story is that part of the museum’s collection consists of spoils, trophies, and diplomatic gifts that ended up in the hands of the Burgundian dukes, the house of Habsburg, and so on. It’s an institution that was founded to propagate the Belgian identity, and the problematic ways in which artifacts from other cultures were obtained is inherently part of that. The ensuing legend painting consists of a vessel of water and a magpie. The water seeping in is such a striking image that I felt it needed to be preserved and seen. Somehow the museum, with all its historical and political bearings, has produced a precious mineral. I had a glass sphere made to display the water, inspired by a makeshift magnifying glass used for embroidery. This brings us back to the idea of folk activism. CD: The magnifying glass is also a thing of the past, as are many other “devices” that you turn to. What attracts you about anachronism? KB: The market directs our attention to high art, and our economy is focused on tourism. But rarely do we speak anymore of the Catholic or Hellenistic heritage that has influenced our culture so immensely. The veil of anachronism installs a detachment that makes one able to see connections across past and present. 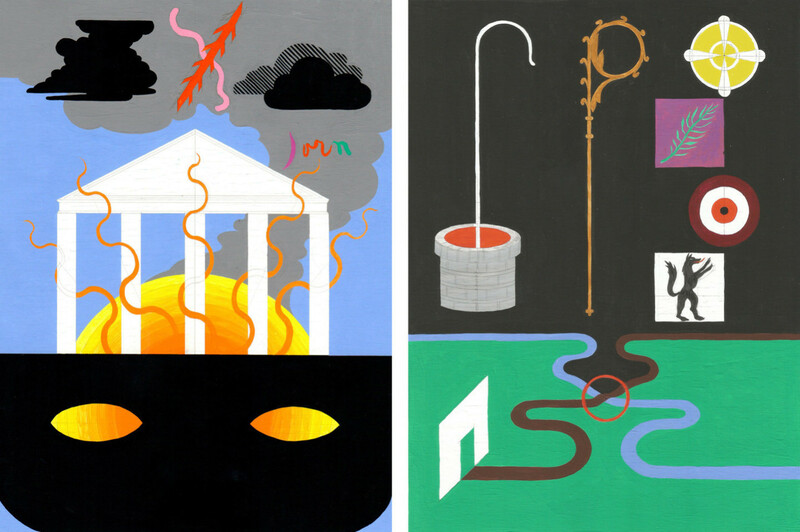 Kasper Bosmans is a visual artist who lives and works in Brussels. Recent solo exhibitions include: Specimen Days, S.M.A.K., Ghent, 25.06 – 04.09.2016, Decorations, Witte de With, Rotterdam, 09.09 – 31.12.2016, with an upcoming solo show at Gladstone Gallery, Brussels, 18.11.2016 – 15.12.2016. Caroline Dumalin is Curator and Coordinator of the Artists-in-Residence Programme at WIELS, Brussels.